Today is the day to snag a great deal from Cents of Style with their FREEBIE FASHION FRIDAY! They are giving away a FREE headwrap with every order today. No minimum purchase amount required. So even if you just buy a $5.00 earring you’ll get a $12.95 headwrap for FREE. 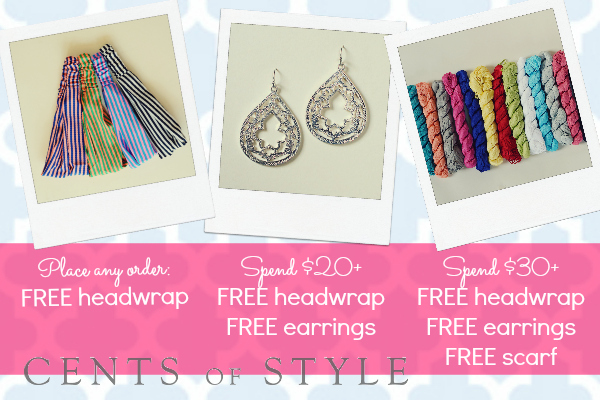 Then if you spend $20.00 on Cents of Style, you will get a FREE headwrap and a FREE pair of earrings. Spend $20, get $22.90 in free product. This entry was posted in Accessories, Deals on May 17, 2013 by Chrysa.